We won't be homeschooling next week, so I wanted to find some meaningful faith-based activities to keep my kids busy. 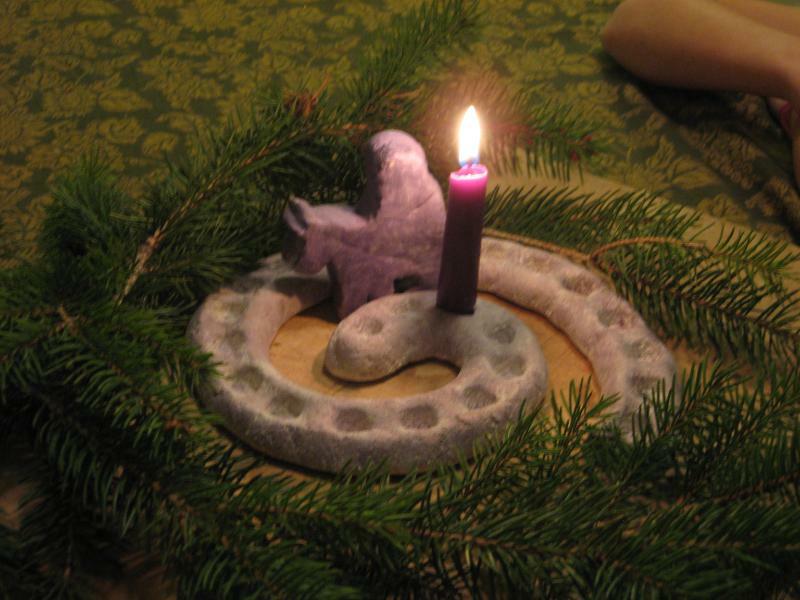 I came across the idea of the Advent Spiral, which I guess is a tradition in Waldorf Schools. Basically, a spiral is created on the floor with evergreen boughs. A lit candle sits in the center of the spiral. 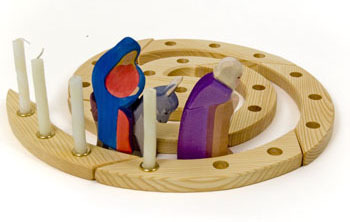 Each child takes a turn walking through the spiral path while holding a candle or votive. When she reaches the center of the spiral she lights her candle, and then walks the path back to the beginning. Sometimes she places her candle along the spiral. When all children have finished, the path is beautifully lit by glowing candles. Prayers or songs may be sung, too. I could see this spiral as the perfect place to sing O Come, O Come Emmanuel or pray the Rosary. Waldorf Without Walls has a better description of the advent spiral, along with ideas on how it can be adapted for a smaller area, like a tabletop. An Art Family blog has photos of an outdoor spiral created with evergreen boughs, in addition to photos of their candle-lit indoor celebration. 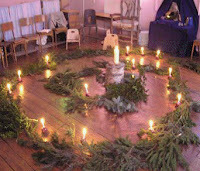 Here is a spiral set up indoors at the Lancaster Steiner School in the United Kingdom. Some spirals are made out of wood to fit a tabletop. This spiral was created by a German company called Grimm's Spiel and Holz Design. Alternately, you could try making one from salt dough, like Kimberly demonstrates on her blog Catholic Family Vignettes. Wouldn't this be a nice activity to accompany prayers for each evening in Advent? I'll be filing this idea for next year! That wooden one is pretty cool! I would love something like that.